Bootcamp Youth Park by C.
Weight loss gone wrong KUALA LUMPUR: A 30-year-old man spent RM80,000 on a weight loss programme but ended up having 30 open wounds, with one as big as a fist, around his waistline. The man, who only wanted to be known as Lim, said he got to know about the “needleless injection” treatment when a friend suggested that they enter into the cosmetics business in October 2009. For months, Freddie, SC and gang had been asking me to join their gym, join Bootcamp and all I have done is to join them for lunch, tea and dinner :-). Last month, I started my keep fit regime and so far, it has been good BUT the battle of the bulge is a real uphill battle. So whats stopping you from exercising ! Bootcamp is fun, exhilarating and stress busting. 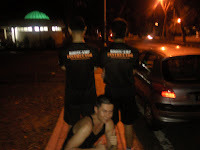 Bootcamp is different from other fitness training programs. We motivate and challenge you to realize your personal fitness goals. We train in natural environment. Get close to the nature. Make new friends and have laugh doing it together. Lose weight and get in shape faster! Train in an outdoor environment! Experience something different! Have Fun! Reduce stress! Make new friends! Professional Instructors!